Celebrity Interview with “Sleepy Man Banjo Boys” by Music Charts Magazine’s Big Al Weekley. The interview and performance is LIVE! Please listen and watch the video below. If you are a fan of “Sleepy Man Banjo Boys” this video is a must hear & see! Forty-five minutes from New York City in the western hills of New Jersey live the Sleepy Man Banjo Boys. 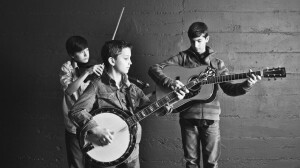 With a combined age younger than music’s Hip-Hop era, eleven-year-old Jonny Mizzone on banjo, along with his brothers Robbie (14) on fiddle, and Tommy (15) on guitar are determined to bring their up-tempo acoustic string music to the next generation. Inspired by the 1950’s music of Flatt & Scruggs & The Stanley Brothers, the Sleepy Man Banjo Boys are passionate about sharing their God-given musical gifts and invite you to watch them grow. Released in October, their second album “The Farthest Horizon”, charted at #4 on Billboard’s Bluegrass Album Chart.